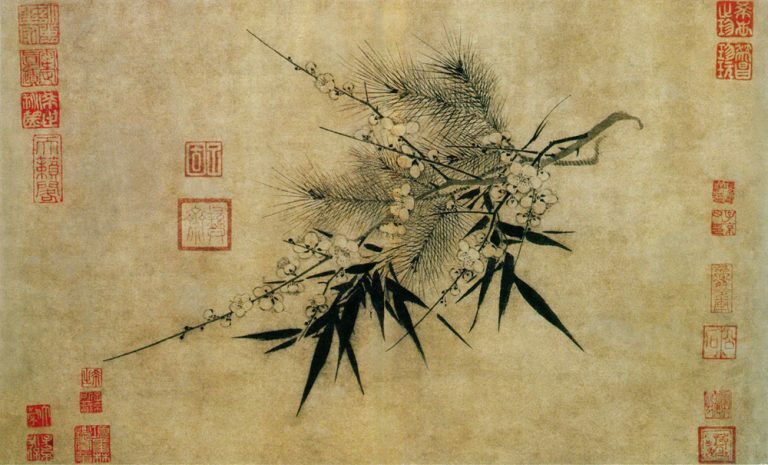 In China, Communist Party members have always been prohibited from holding religious beliefs. 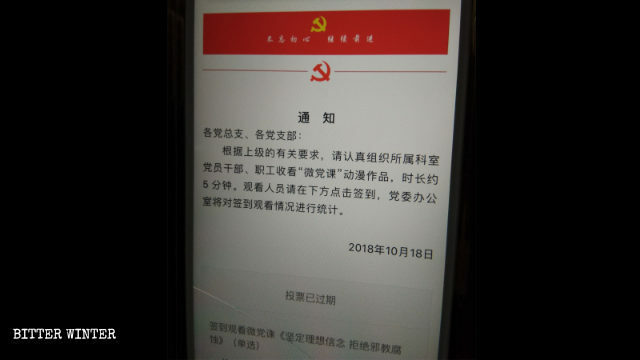 Last August, the Chinese Communist Party (CCP) authorities incorporated this conventional principle into the newly revised Disciplinary Regulations of the Chinese Communist Party, increasing the level of punishment for Party members with religious belief or sympathies. 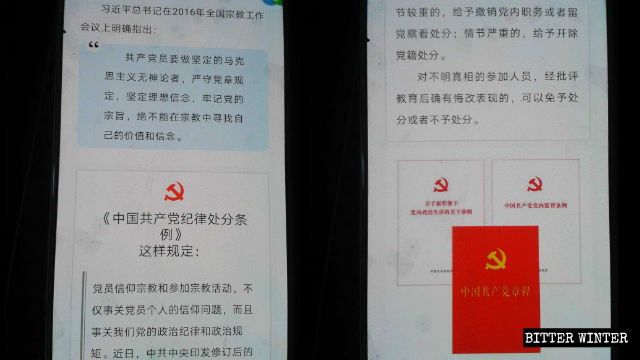 Propaganda materials declaring the Communist Party members cannot believe in religion, issued by a school in northeastern China. 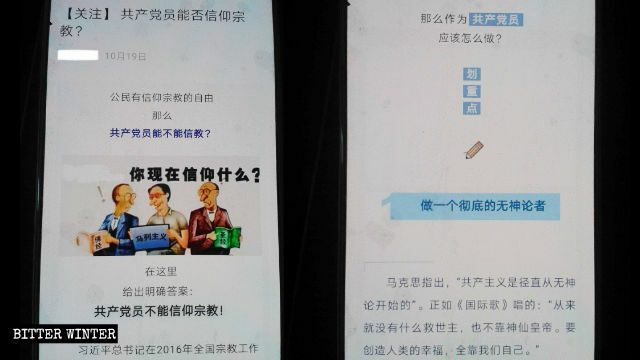 To promote these new regulations among members, the CCP’s Organization Department released a five-minute “Party micro-lecture” video on its “website for modern distance education for Party members and officials throughout the country.” The video encourages Party members to study, and emphasizes that there is “zero tolerance” for Party members who have sympathy for religion. 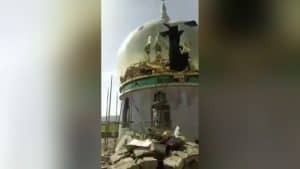 The video also states that even after Party members have retired from their official positions, they cannot believe in any religion or participate in religious activities. If they are discovered doing so, they will be expelled from the Party. A public institution demands its Party members sign their names after watching a “Party micro-lecture,” to make sure that all have been acquainted with the atheist propaganda. Since these new regulations were implemented, the authorities have been investigating the religious beliefs of CCP members. 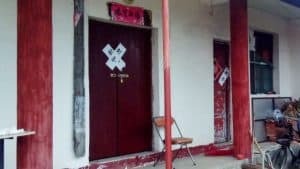 Liu Cheng, a Party member in his seventies who lives in Shangzhi city, in the northeastern province of Heilongjiang, received a warning: he must not hold religious beliefs, and he must stop believing in God. 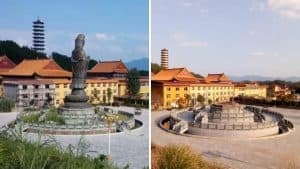 According to Mr. Liu, in December 2018, Shangzhi city’s Organization Department sent personnel to warn him that believing in God and believing in the Party are two separate paths. Party members are not allowed to have any religious beliefs. They must only believe in the Communist Party and follow the ideology of Marxist atheism, or else they will be expelled from the Party. Mr. Liu said that, ever since he started believing in God, he has been ready to withdraw from the Party. Under severe coercion from the authorities, he finally made the final decision to leave. During the same period, the deputy secretary of a school in Dandong city received disciplinary action from the Education Bureau’s Commission for Discipline Inspection because he believed in God. As a result, he was relieved of all duties within the Party. Under the CCP’s harsh suppression, Party members have had no choice but to make compromises and concessions. 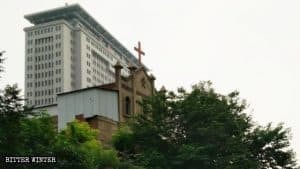 Wang Xinguang is the chief deacon of a government-approved Three-Self church in Shangrao city, in the southeastern province of Jiangxi. According to sources, Mr. Wang was warned by the local government: Party members are not ordinary people; the Communist Party is atheistic, and its members can only believe in Marxism-Leninism. They cannot have other beliefs and cannot participate in any church activities. Doing so would be a violation of Party discipline, and they would receive disciplinary punishment and be expelled from the Party. In addition, his children would also be implicated. In the future, they would be unable to join the army, and their employment prospects would be affected. Under such pressure, Mr. Wang had no choice but to resign from his position as the church’s chief deacon, and can no longer participate in any church activities. The Chinese Constitution stipulates that citizens enjoy the freedom of religious belief. In reality, however, the CCP authorities have always attacked religious faith and do not give citizens the right to freedom of belief. 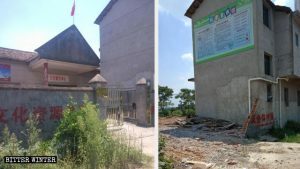 The repression and persecution that Beijing’s Zion Church and Chengdu’s Early Rain Covenant Church suffered last year are only the most infamous examples of the Party attitude toward religion. This is true for ordinary people of course. For Party members and officials, on the other hand, religious faith is even more of a “red line” that cannot be crossed. Those who follow religious matters in China say that many Party members and officials hide their religious beliefs and participate in religious activities. Fenggang Yang, a professor of sociology at Purdue University in the United States, points to a survey conducted by Horizon Research in 2007. According to that survey, at least 85 percent of CCP members had a certain religious inclination or participated in religious activities. The fact that so many Party members have religious beliefs is also regarded as a hidden danger by the authorities. Hu Ping, a political commentator and the honorary editor-in-chief of Beijing Spring, said in an interview with Voice of America that the Party’s crackdown on religious Party members removes obstacles to the CCP’s efforts to suppress local religious activities. (All names used in the article are pseudonyms).